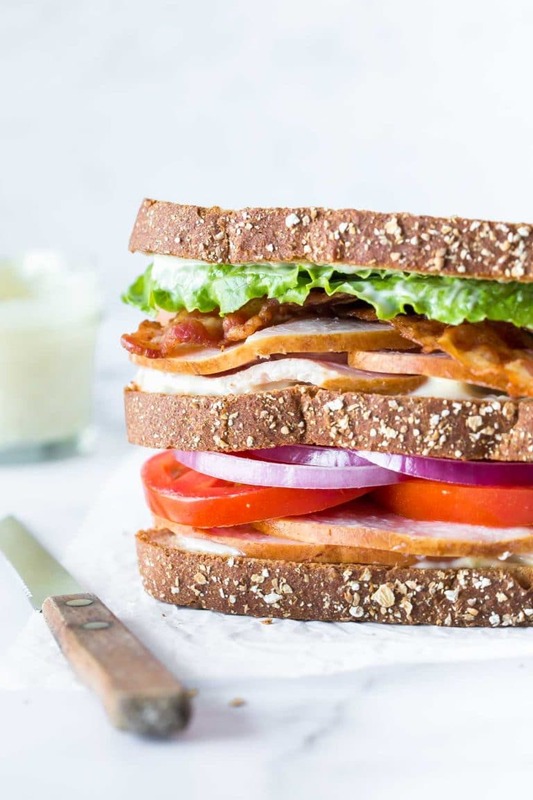 This turkey club sandwich recipe features premium carved, oven roasted turkey breast on whole wheat bread with lettuce, tomato, crispy bacon, and topped with a creamy, garlic aioli sauce. It’s quite possibly the ultimate lunch. Serve it with chips and a pickle for a classic restaurant-inspired meal. Makes 2 servings. Lunch has never been my forte. I usually opt for leftovers over making something for my afternoon meal. But, when I am going to have a sandwich, it has to be awesome. Like, way better than a brown bag lunch and over-the-top filling, and if it includes bacon, I’m even happier. That’s the beauty of a club sandwich. It’s like a complete meal in sandwich form. Since going dairy free, it’s also become Marc’s go-to at restaurants. Besides reminding them not to use cheese and making sure the toast doesn’t get buttered, it always seems like a safe option. We’ve probably ordered a club sandwich at every restaurant in the city, but his favorite one comes just like this. 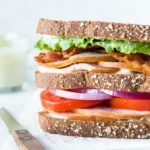 A simple turkey club sandwich with garlic aioli. 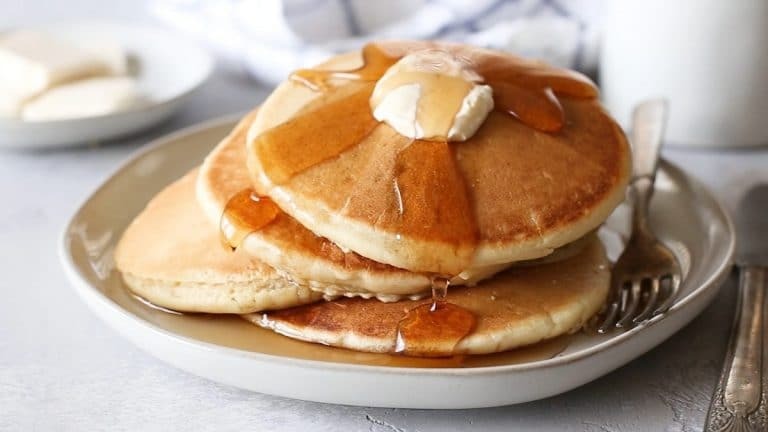 It’s a classic and it’s beautiful. 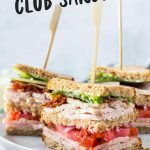 What is in a club sandwich? 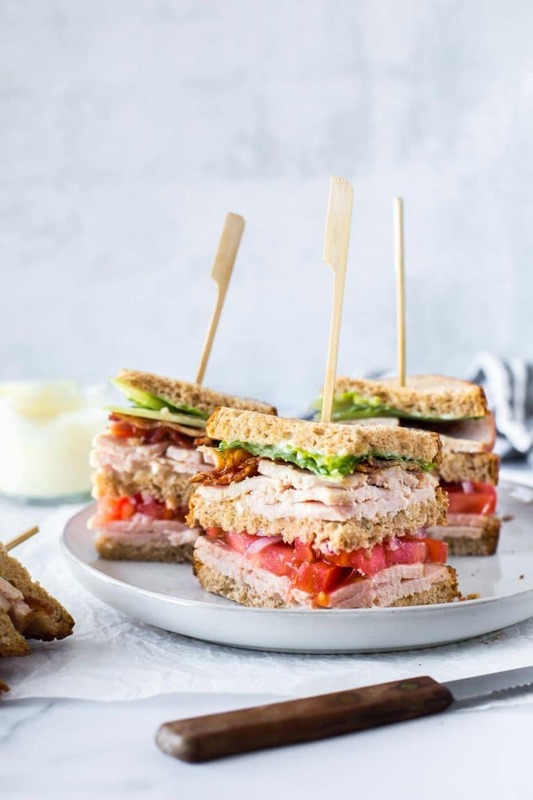 A club sandwich is basically just a BLT with added protein like turkey, ham, or chicken. Traditionally, it’s served on white bread with mayonnaise and iceberg lettuce. While that could be amazing, I’ve taken things up a notch and used homemade garlic aioli and romaine lettuce for added flavor. I also opted for whole grain bread because that’s all ever have on hand. I figure if I’m going to eat the carbs, they might as well be the best carbs. 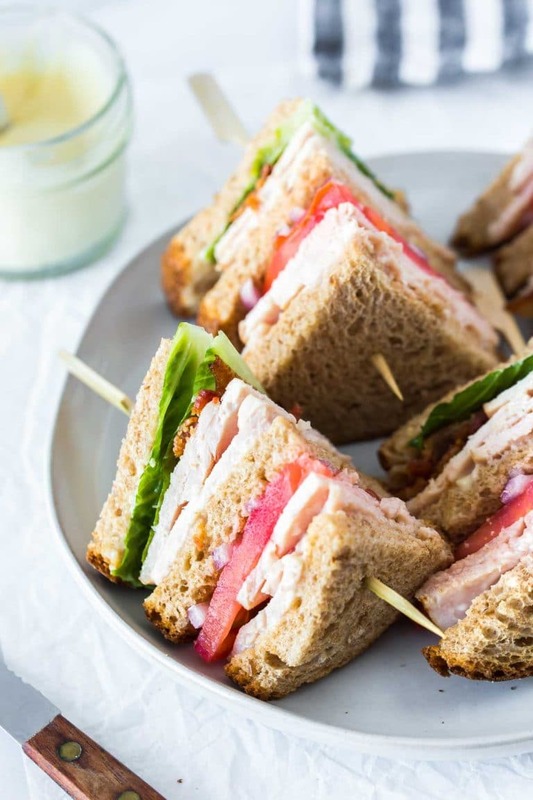 Building the best club sandwich requires using premium ingredients, which is why I chose Hillshire Farm® Premium Carved Oven Roasted Turkey Breast from Walmart. It’s all natural, with no nitrites, nitrates, or artificial ingredients. Plus, the quality and flavor are unbelievable. I opted for a turkey club sandwich, but you could easily use any combination of meats you prefer. 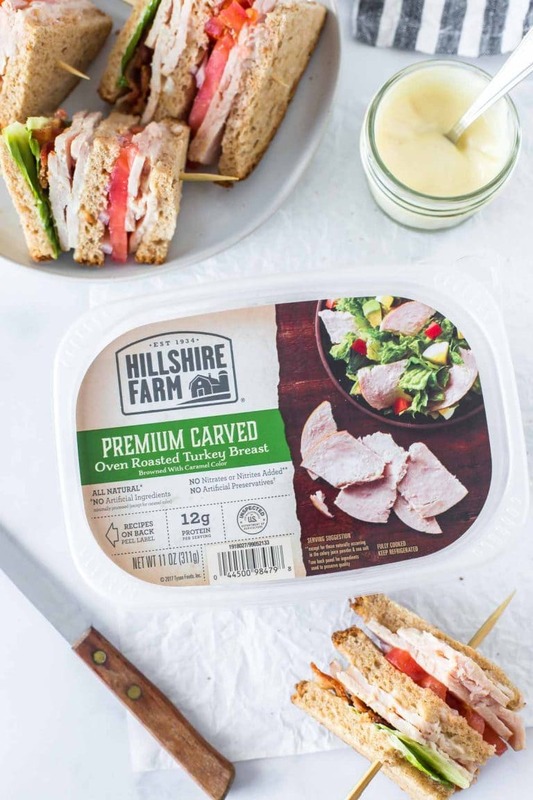 You’ll find Hillshire Farm Premium Carved Slow Roasted Seasoned Ham and Hillshire Farm Premium Carved Rotisserie Seasoned Chicken Breast is also available (alongside the turkey) with the packaged lunch meat in perimeter coolers at Walmart. I love making my own homemade aioli. If you want a detailed tutorial on how to make it, be sure to check out that post. There’s also a video tutorial in my fish taco recipe post. I’ve listed the ingredients and directions for how to make it in the recipe card below. If you want a faster option, finely mince your garlic and add 1 cup of store-bought mayonnaise, along with a teaspoon of lemon juice and a pinch of salt. If you don’t already have cooked bacon, now is the time to make it. I recommend using freshly cooked bacon because it’s significantly better than the stuff you can buy pre-cooked. My favorite way to cook bacon is in the oven, but frying the bacon in a pan will give that picture perfect wavy-bacon look (if you’re into that). Slice your tomatoes nice and thick. Wash your lettuce and cut it in half, width-wise, and thinly slice a red onion. And, don’t forget to toast your bread. I don’t like mine super crispy, but I like to get a good brown on it for extra flavor. Spread each piece of bread with a layer of aioli. Then, top two of those pieces with Hillshire Farm Premium Carved Oven Roasted Turkey Breast. Next, add tomato and red onion to the first, followed by the next piece of toast with aioli and turkey. 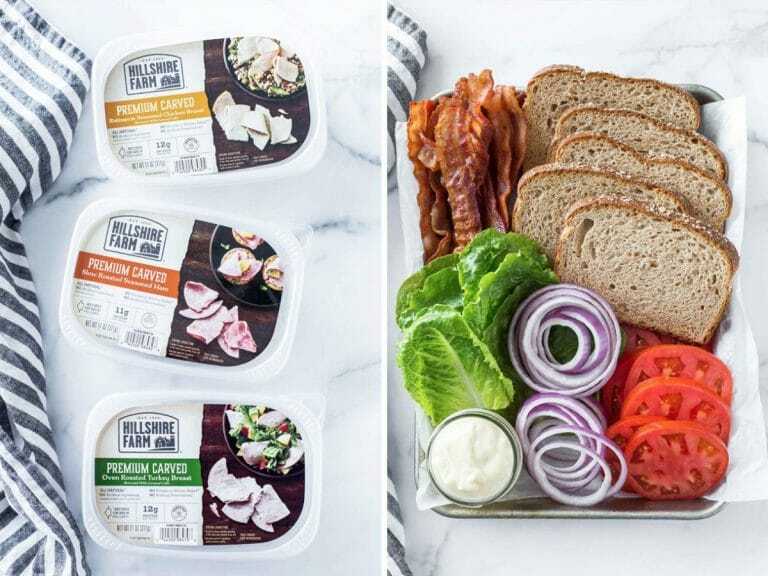 On the last piece of toast with aioli, arrange the lettuce and bacon. Carefully flip that piece onto the top of the club sandwich. 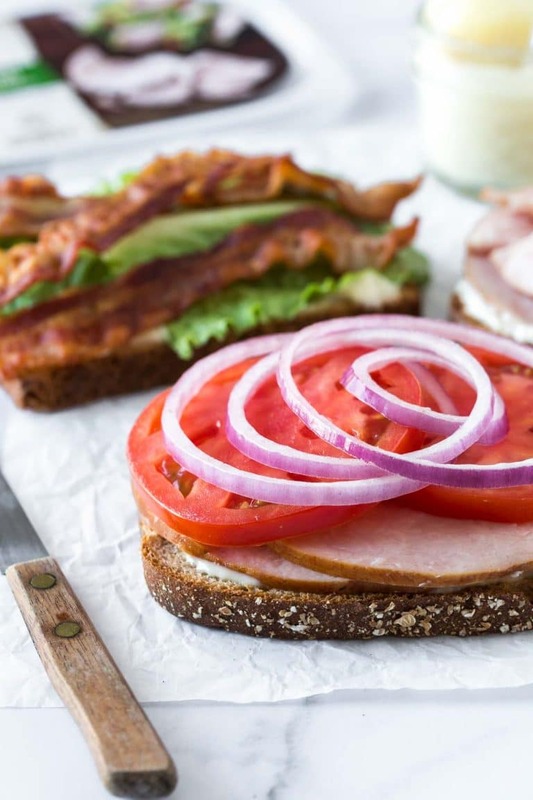 Place a skewer in each quarter of the sandwich and carefully cut in half, length-wise and width-wise.